How can I dispose used and damaged pallets? 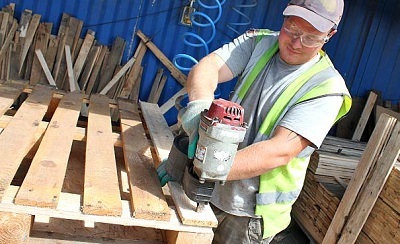 Businesses that take in or distribute physical goods often find that they end up with an accumulation of wooden pallets. It can be difficult to know what to do with these. Here is a look at some of the options. This can be an excellent approach to boosting your carbon management as a business, reducing costs and meeting your operational sustainability targets. Remember that many of today’s customers actively choose to do business with suppliers that demonstrate an environmentally friendly approach to their operation. Recyclers are often called specialists in ‘reverse logistics’, which means that they provide an end-to-end management and control service of your packaging materials. Whether you end up with a backlog of plastic or wooden pallets, boxes and frames, collars and tops or crates, they will take these items and recycle them according to the latest best practices. They may even devise and implement a system that helps you to reduce the time and cost of sorting packaging materials and containers in-house if you receive large quantities of these from your own suppliers. To reduce waste and costs, look into pooling as a way of doing business. Some suppliers will provide you with packaging items that can be re-used, and they will even come with integral devices for tracking. By using a specialist pallet provision and management company, you will be able to have yours supplied, cleaned and repaired, and made available for re-use. Remember that a pallet should be viewed as a reusable item for packaging, rather than a ‘one-off’ item. Most pallet solutions are suitable for use time and time again. It’s important to be aware of the Waste Framework Directive in the UK, which regulates packaging use and necessitates that businesses reuse where possible, rather than recycling as a second option or disposing as a third. By economically recovering a used pallet and using it again, you will reduce both your business’s carbon footprint and packaging costs. 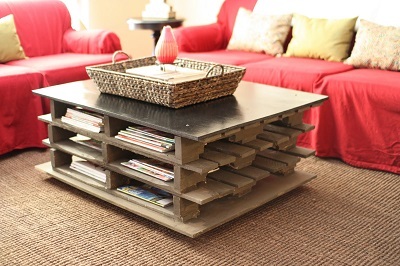 Some wooden pallet types can be used in pallet crafts, which is a small but growing movement. However, these packaging items shouldn’t be used for craft purposes unless they can be confirmed as untreated with preservatives, fungicides or pesticides. It may be worth using those which aren’t, if you wish to reuse the wood for firewood or make it available for local recyclers or craftspeople. This is an important thing to check because a lot of wooden packaging items are treated with chemicals and these can be harmful and toxic. If it’s been used for transporting hazardous or toxic materials, the pallet should always be disposed of according to your local authority’s regulations. Speak to the waste management department to find out what regulations are in place, or use a pallet disposal provider who can manage this for you. If wooden packing items are untreated and safe, however, the craft uses for them are broad and varied. Some people use them to make sports-related items, such as skateboarding obstacles. Others use them in the garden as planters. They can also be used for fences or small animal homes, and some companies have begun to use the wood for furniture and other purposes.